Ecolodge l'Etoile d'Argens luxury camping site is ideally located next to the golden sands St Aygulf. Stowed away deep in the heart of the fabulous French Riviera, this delightful oasis surrounded by luscious vineyards is an ideal destination for holidaying families. There's a choice of luxury mobile home and bungalow accommodations on offer so why not get your holiday off to a good start by placing a booking with LuxCamp today. Camping Ecolodge l'Etoile d'Argens has a really strong commitment to the protection of the environment, living ecosystems and your health. Welcome to Camping Ecolodge l'Etoile d'Argens. 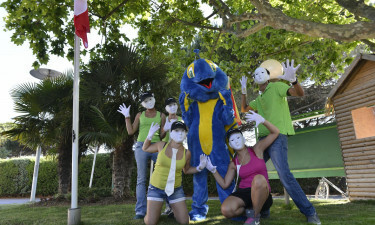 About Camping Ecolodge l'Etoile d'Argens. What's on offer at Ecolodge l'Etoile d'Argens camping holiday? Free river boat ride that delivers you to a sandy beach. Close proximity to St. Tropez and other tourist beauty spots. Direct access to river for a spot of fresh water fishing. L'Etoile d'Argens offers exceptional luxury camping to guests, placing their restaurant and bar right beside the 3 pool swimming complex. The lagoons are outdoors and heated; one for the family, a smaller pond for kiddies and a larger one for doing those laps and lengths. When you've tired of your bungalow tent or mobile home, take a free boat ride along the river which will deliver you directly to a gorgeous sandy beach front. Plan a day excursion into nearby St Tropez and get a taste of the good life extraordinaire. A firm favourite tourist hotspot in the Côte d'Azur region, this hustle and bustle town is renowned for attracting the jet-setters. It will thrill the family with its opulent yachts, moored by the harbour. There are endless strips filled with fabulous designer shops, bars and bistros. It's a real artists’ haven and you might want to taste some of the non-stop nightlife. Don't forget to pop into La Ponche quarter; perfect for an old-fashioned walkabout. 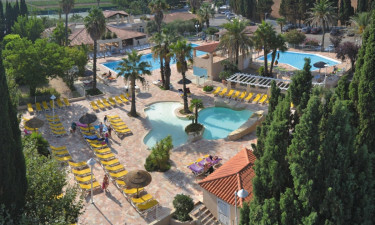 Ecolodge l'Etoile d'Argens campsite has excellent activities with tennis courts, table tennis and crazy golf to name a few. The surrounding areas provide ample opportunities for expeditions, day excursions and walking trails. You can hire a bike and go cycling through the sprawling metropolis of vivacious vineyards. The lake is right beside you and suitable for fresh water fishing. You can also hire boats, dinghies and wind surfing equipment and further afield you can explore the majestic mountain range of Le Massif de l’esterel. Camping Ecolodge l'Etoile d'Argens pulls out all the stops so you don't have to go far when you fancy a drink and something to eat. The restaurant and bar are conveniently constructed right beside the pool so you can dine indoors or al fresco if you so choose. Ecolodge l'Etoile d'Argens holiday resort has an onsite grocery store, which is perfect for stocking up on those everyday essentials. Stop by in the morning to avail of the local fresh bread and pastries. Stock up on grocery basics like tea, coffee and biscuits. The surrounding towns have many good shopping choices for those much-needed souvenirs for folks back home.